Pretty surprising that Pit basically got a new moveset, but Ganondorf just got faster. It is? When Sakurai is directing? Haha, true. Didn't think of it that way. Thanks for adding! And can you add my 3ds FC too? Don't hate me but I'm leaning towards the leak being real now. Me too. Although i'm sure that it's not the full roster. Well he did say he couldn't confirm it was the full roster, but said those other spots were for the 5 DLC characters.... Hmm, maybe that was just a guess tho... How would he know DLC? The DLC characters could possibly be like an option to go to by the custom option? I don't really care, as long as we get our Zelda Newcomer and DK Newcomer! Hyrule Warriors Direct Recap: 14 minutes of stuff you already knew about, 1 minute of pure epic to make up for the rest!!! Yea... well, there's no way the Ocarina won't be in this game somehow so there's still hope. Yeah, I realize that. Also, we need Ashei and Groose. Yea I was surprised that there weren't any heroes revealed in the Direct when they've been announcing them here and there with scans like every other week. Or at least that's what it feels like. Can't say I was disappointed though, not at all. Honestly though, those make sense as the top 3 priorities for many reasons. Well, Tingle is a recurring character, so he could be part of the main universe characters. Also, Skull Kid technically appears in OoT, and there are MM aspects in the game, so perhaps they will both be in the game? If not, a Majora's Mask DLC Story arc with Majora's Mask locations and Skull Kid as the villain and Tingle as a character would be cool. So, you are/were in China, correct? If so, that would explain why I only see you online when I'm doing an all-nighter. Yup! Geez it must be like 4-6 AM there. When do you sleep? zzzzzzzzzzzzzz..ugh, huh what? Did you say something? I finally got to watch the Lucina/Robin/Falcon trailer! Definitely worth the wait! So much hype! Well? Did the trailer surprise you? Are you happy with what we got? I know I am. I've seen a lot of gifs though. I already loved Lucina and Robin before. Lucina looked very fast with little lag. Robin appeared to have Fire and Nosferatu (easily my favorite move in the series). Definitely excited already, but I'll have to wait a week for that trailer. 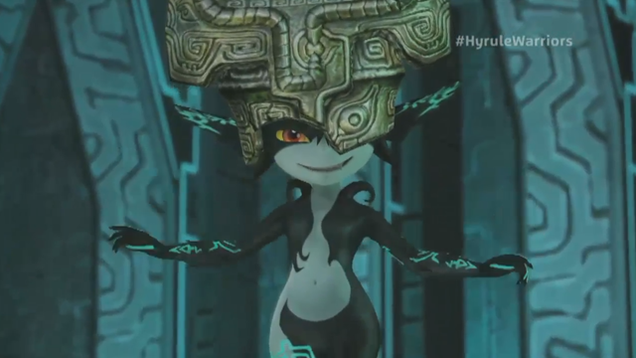 I saw the Midna Highlights trailer they released for HW. It looks great. Assuming you'll be online tomorrow, you should PM me if you there's a character revealed for HWs tomorrow. I'm pretty sure it's Fi, but we'll see. The official Twitter page for HW tweeted there was a 98% chance of a character reveal tomorrow. Nvm they revealed Fi and disconfirmed Ghirahim. Fi is love, Fi is life. Hey, I got a question for you. How come a lot of your posts have had some...grammar issues, lately? Most punctuation. Is is because you're using a phone to post? Yep. I'm getting back home today though so I should have my laptop in a few hours. I hate having to make posts with a phone, it tried to call Aran Ryan - Arab Ryan. Agh. Lol. I think autocorrect exists to troll humans. Agitha and Midna fan? I'm very excited to try out Hyrule Warriors and Zelda U once they are released, since I haven't really played too much of the LoZ series yet. I was away when you posted this, but I'm back now and I agree. There is so much potential with each character! I'd love to see every single one of them translated into a Smash character! Agh, maybe we can one as DLC. Stop getting likes until I beat you! Let's hope for Ashei together. Ah well, I hope Agitha, Lana, and Zant get sections on the website soon. The Gematsu picture is tiny, I had to use her Twilight Princess appearance as an avatar for now. Midna AND Agitha are back!!! But you should probably leave those 2 alone as they were re-rated after their potential deconfirmations. Either they should be listed as very unlikely or they should have kept their higher scores and been listed as deconfirmed. If you disagree with how they were rated, you can nominate them when we do nominations again. Since Lumas are both stage elements and part of a playable team, and Lip is able to use her stick in many ways that don't include what the item does-- I'd give them both a 1% chance. Although, I'm glad you listed Isa and Reggie as deconfirmed. People have disagreed with me about the first one, and I hadn't even thought about the 2nd but that makes sense. Why did you tag me for RTC Palutena? I was a Palutena supporter, but I'm not as vocal as some.... so I'm just curious. Ah, yes I remember. Well, thanks for remembering me! So I imagine Hyrule Warriors is now a day one purchase for you, right? Cause it is for me. No, no, I meant private messaging, ha ha. Though we could discuss Project M if you like. I'll probably be sleeping soon. Ah, I see. I saw you offline for a while, I actually thought you were just getting back up. Funny. Well, you pick the topic. I see a pattern. Characters are getting revealed right as I start to doubt them. I'm going to go doubt Ghirahim and Anna now. Me too. It seems Sal Romano is right, I will expect an absolutely terrible roster right now. But seriously. Dis avatar is hot. Well she is finally getting some well-deserved attention. Here's a better picture of her. Soon my forehead will be black. I made the smart decision and went to my actual bed. School is out, so I'm basically hibernating. By the way thanks to you I hit 100 likes, you have my gratitude! Style Saavy got five noms today, so if I give her 2, will you give the last one and then some to Anna? Thanks! I need that Anna rerate. Hope you don't mind, but I referenced a post you made in the RTC thread (the one about Miis) to argue against the Sal leak. I hope that's not a problem with you. That sums it up well. A non-biased view of what could be the end of the Miis and the Sal Leak. I forgot about this before, but it could be argued that the moveset customization (which people did once use as evidence for Miis) being used by every character and not being unique to the Miis also hurts them a bit. It's not as big of a reason as that icon, but I wanted to bring it up. Yes, I considered mentioning that. However, ultimately that was just one idea that could have made them unique. They have plenty of material to work with aside from that, so I felt like brining it up would be fairly pointless. Also, it could be said that I'm biased for Miis. I'm a Mii supporter myself, despite me ranting on their chances as of late. Look, stop. Please don't nominate Bomberman. Your reasons are rather low; you want to bring him down just for the charts? I don't think that there is a need to re-rate him at all; I don't care if you want to, it doesn't need to happen. I beg of you, PLEASE STOP NOMINATING HIM. I will stop talking crap about Rosalina, just please don't nominate him. His day was heartbreaking to me. I'm dead serious, just stop. I just wanted to let you know you are one of my favorite users - you are so enthusiastic in what you support, and so charismatic, and most important, we both love Midna and Ghirahim with all our hearts! :P It's great to have you around, it what I'm saying, I'm sure most would agree! I just mean you like hanging on that thread. You also like taking votes. I'm the same way about listing things. I can't create an image of multiple things at the same time in my brain without listing them on paper. And I making too many assumptions? You're not, "listing things" is something that's been said about me before. It's funny to see it on here though. I make lots of guesses about people here. People do the same to me. "Kenith is such a nice guy!" Ha, wait until you see the real me. BABY ROSALINA EXISTS NOW. YES!